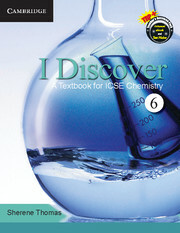 I Discover is a Textbook for ICSE Chemistry is based on the latest ICSE curriculum. 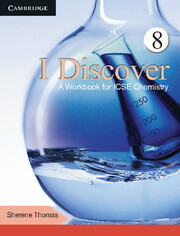 I Discover is a Workbook for ICSE Chemistry is a series for classes 6 to 8 based on the latest syllabus of Inter-State board for Anglo-Indian Education. These workbooks encourage students to self-examine thoroughly and help them in the process of learning Chemistry through active participation. They can be used in conjunction with the textbook I Discover: A Textbook for ICSE Chemistry, but it may also be used independently. Points to remember summarises the key points of a chapter and helps in quick recapitulation. Important definitions explains scientific terms and definitions. Wide range of questions to assess skills, such as, knowledge, data and information handling and processing, application and understanding. Sufficient answer space provided to write answers. Questions involving reasoning and thinking skills will push students to think beyond the text.